I don't particularly like television, so I don't really watch a lot of it nowadays. 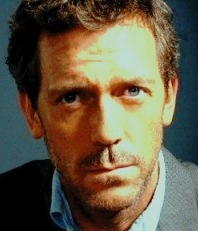 Still, there are a few shows which I enjoy and one of those happens to be Fox's House, M.D. My wife had to turn me onto it because I thought it looked like just another hour-long medical drama in the vein of St. Elsewhere, ER or Chicago Hope. She told me that it was really more of a mystery show (she knows I love mysteries) and informed me that its protagonist, Dr. Gregory House, is a complex, charismatic and provocative character. His antisocial, unethical and misogynistic tendencies are matched only by his brilliant, obsessive and astute mind. Although it jumped the shark a couple seasons ago, I continue to tune in every week. Even through the worst of its outrageously cheesy and absurdly melodramatic plot twists, House himself (superbly played by Hugh Laurie) remains a fascinating character. 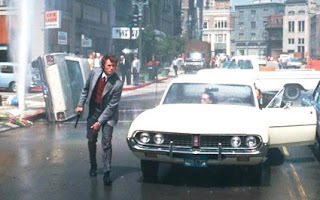 Right now, you're probably wondering to yourself why I'm talking so much about House in an article that, given the headline and picture above, is clearly about the 1971 Don Siegel film Dirty Harry, which celebrates its 40th anniversary today. Well, here's my reason. Although it is obvious that House is based on Sherlock Holmes, it occurred to me at a certain point that another fictional character has about equal claim to being a source of inspiration: San Francisco cop Harry Callahan. Harry may not be as brilliant as House, but he has about as much regard for social niceties, can be about as misogynistic and, just as House, always acts in the best interest of those he's trying to help (even if it means disobeying his superiors, putting his own life and career in jeopardy or even tricking, manipulating and sometimes even hurting those he's working to save) in his drive to ensure that justice prevails. The criminals' rights and the rules and regulations that his bosses demand he follow while pursuing those perpetrators concern him less. Harry, like House, just doesn't give a damn and when I realized that in many ways House could be described as "Dirty Harry with a medical degree," I understood not only how iconic Clint Eastwood's brave, tough-talking cop had become but what purpose characters such as Harry, House and their ilk serve for audiences. Dirty Harry was made in a time when society wasn't feeling particularly safe. This seemed especially true in San Francisco, where the film is set, with the activity of the Zodiac Killer (on whom the movie's psychotic Scorpio Killer, broadly but effectively played by Andy Robinson, clearly is based). Much of that anxiety and frustration ended up being directed at the state and the filmmakers captured it. This anger doesn't seem aimed primarily at cops (indeed the film is even dedicated to San Francisco police officers who have given their lives in the line of duty) but rather to the system for which they work, a system that many people (much like today) felt had gone out of control. It presumed to function in the interests of the innocent but instead came off as more dedicated to preserving itself and/or the rights of the criminals. There is a very strong "anti-authoritarian" attitude present in Dirty Harry. Throughout the film, Harry's desire to protect civilians from the malevolent force of evil, much to his dismay, constantly gets hindered or thwarted. Consequently, Harry, in essence, becomes a vigilante with a badge. He renounces his oath to serve the law and devotes his efforts to serving justice. In the film's final scene — with the Scorpio Killer in his sights — when he utters those famous lines ("I know what you’re thinking: 'Did he fire six shots, or only five?' Well, to tell you the truth, in all this excitement, I’ve kinda lost track myself., etc.) for the second time in the film, Harry clearly snarls the words with much more rage and menace — his attitude has changed. The bureaucracy's incompetence always annoyed him, but he has become so "fed up" with the whole thing that he wants no part of it. After dispatching Scorpio with his Magnum, Harry removes his badge and tosses it away. Obviously, no one planned any Dirty Harry sequels. This truly ends his character's story, not the subsequent adventures where Harry softens a little more in each new film. When Dirty Harry was released in 1971, it caused quite a stir. Many critics, including Pauline Kael and Roger Ebert, articulated concern over the ideas and values expressed in it (with Ebert even calling it "fascist"). While I fully understand having such a reaction, I can't help but think that they are somewhat missing the point of what role such an extreme character can play for audiences and why Dirty Harry proved to be such a commercial success in its day. We all feel oppressed at times. We all feel abused or maligned and we all secretly wish we could act out the fantasies of retribution we have. Fortunately, we don't (or at least most of us don't) act on these impulses. Still, there is something appropriate about wanting to see good triumph and evil punished. 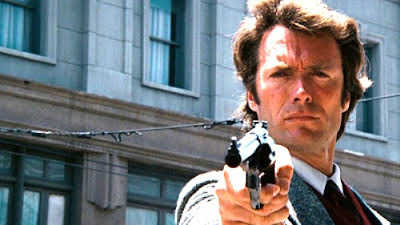 Dirty Harry serves as a vessel for pent-up frustrations with our own impotence, an ideal of the kind of courage and tenacity it takes to do the right thing (regardless of the personal consequences) and watching him do what he has to do proves cathartic. We live vicariously through him as he says and does the things that we can't say and do but wish we could. He understands that the law is merely a man-made institution — it is not sacred — and if he must circumvent it sometimes in the name of the greater good, he'll do it. In fiction, one can get away with this. In reality, we don't have that luxury — reality always turns out to be far more complex, messy and nuanced than the simple black-and-white moral universe represented onscreen. So, we watch the rogue endeavors of vigilante heroes such as Harry, House, Robin Hood, Zorro, Batman or, even on occasion, James Bond (such as in Casino Royale when he just marches into an embassy, grabs a guy by the scruff of the neck and drags him out) and rightfully admire, respect and perhaps even envy them. As long as we don't imitate them, they fulfill their proper role in our lives. Sometimes to do good, you gotta get your hands a little dirty. One thing I do have to take exception with is lumping St. Elsewhere in with ER and Chicago Hope. St. Elsewhere ruined me for all medical shows until Scrubs (a comedy after all) and House (which indeed hasn't been good for a long time aside from Laurie). While not as great as Hill Street Blues (not even close), St. Elsewhere did aspire to be the medical equivalent of that show with a warped sense of humor and a bizarre highly debated ending. Nothing at all like the much more convential later medical series. I think we can all agree the film's politics are worrying at least (I, for one, agree with Ebert), but it still is an absolutely great film (the first two sequels are decent, too).